They found a sign in the restaurant window that the woman translated, “closed for renovation.” Marian hoped her friends had returned to their hotel. “I’m Marian.” She let go of the door handle and settled into the seat. “I came to Paris to decide what to do with the rest of my life. I have only two days left, but I need more time. Something has happened that interrupted my quest and thrust me into a pursuit more confusing than finding myself.” She didn’t know why she blurted personal information to a stranger. There was something familiar about Gen, she reminded Marian of her long absent mother. Marian wondered how people found their way in the City of Light. To her, it created more questions, not answers. Marian absorbed the sights along the way. Lovers strolled along the dimly lit sidewalks and friends sipped coffee at cafes that remained open. The City was alive, unlike the man she had abandoned at Le Pont Neuf. The dead man, whose unique key and photograph now lay in the bottom of her purse, remained a mystery. Marian slipped her hand deep into her bag and gently fingered the cold outline of the key. 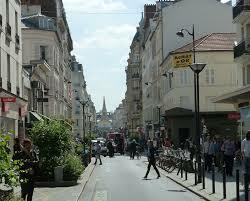 The Citröen turned onto an unfamiliar section of rue de Rivoli. Where was Gen taking her? Marian faked a cough and pushed the key inside her bra before she spoke. “Oh, I think we should have turned right back there.” Marian tried to sound casual, but inside she doubted every decision she had ever made in her life, including her most recent one to get into the car. That’s when it occurred to Marian why Gen’s name sounded familiar. Pierre had read it aloud to her from this morning’s newspaper. “Wife of French National Police Commissioner accused of embezzling half a billion euros.” Pierre had explained what a huge story it was because the Commissioner was well liked, but little had been publicized about his wife of thirty years. Now she was making headlines—and her name was Madame Genevieve Flaubert. Marian struggled to figure out where they were headed, heart sinking as her hotel faded in the distance. Fear and anger flared in her gut like bottle rockets on the Fourth of July. Just as suddenly, she felt her mind suffused with a cool, calm determination. “You are right.” Gen’s voice was reminiscent of a teacher praising a bright student. As they passed under a street lamp for the first time, Marian could see the deep circles under Gen’s eyes and the strain on her kind face. Marian glimpsed a sliver of opportunity as Gen downshifted the old gears of the Citroen at the red light. She grabbed at the metal door handle, but a hand from behind jerked her back on the headrest. The sweet scent of chloroform filled her nose before her vision faded to black.